I’ve been gardening for a long time. I really love working outside with the plants and getting delicious homegrown produce and herbs is a big bonus. I’ve gardened in so many different ways from raised beds to large pots when I was renting and couldn’t dig up the lawn. A few years ago I heard about this movie called Back to Eden. It’s about Paul Gautschi who’s an organic gardener from Washington State. He lives in an area that has very dry summers and came up with this great mulching system to keep the plants moist. There have been many books about mulch and how good it is for your garden but most of the one’s I’ve seen, like Ruth Stouts books use straw for mulch. 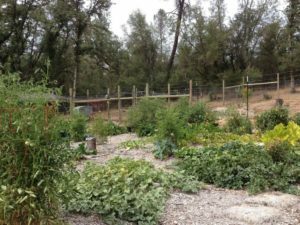 We live in Northern California where we have very dry summers so when we moved here a few years ago and I was getting ready to start a new garden from scratch, I knew I wanted to try Paul’s system. We needed to have a number of trees cut down to make a spot for our garden as our property is heavily wooded so part of what we looked for was someone with a really big chipper. We found a great company and they chipped most of the trees that came down in the garden area. The rest we chopped into firewood. We did a layer of cardboard to cover the weeds, then a layer of cow manure, then a layer of compost then at least six inches of wood chips. We got our garden finished in early April of 2013. Ideally, you are supposed to get your wood garden finished six months before you plant but it didn’t work out for us that way. I planted about a quarter of the garden out in June and figured it would be an experiment as it was too soon to expect good results. It did really well! We got tomatoes (including a great volunteer plant from the compost we used under the chips), eggplant, pumpkins and one great melon plant. I planted a few things over the winter like garlic and cabbage, but as we got so little rain and I didn’t water at all, it just did okay. This summer I went for it. Planted a lot and it’s been just amazing. We have irrigation water so I am supplementing water but only an hour or so, twice a week. I don’t think I make a garden any other way. The chips absorb moisture if they get to wet, and keep moisture when it’s dry. Here’s the link to the movie and the picture is our garden this past August. You can watch Back to Eden for free at the link below.